1. If you were to make an appearance at Comic-Con, which Superhero costume would you be rocking? It would be Wonder Woman. The girl is armed with a truth lasso and killer cuff bracelets. Bonus, she has a jet. 2. At which time of day are you more productive as a writer, mornings or nights, and is caffeine a friend or foe? I think it really depends on what’s going on. I wish the moments I’m creative are scheduled. I’d say nights win though. Caffeine is a great pal, but red wine is a close friend. 3. George Clooney or Bradley Cooper? Definitely, Bradley Cooper circa “Limitless” and “Silver Linings Playbook”. He always plays characters that make me laugh and feel. 4. What is your biggest dream as an author? Well, if we’re dreaming big, I would love to see one of my books on the big screen. 5. Name a movie you’ve watched countless times but one you’ll still tune in to whenever it’s on cable. 6. How many books have you published and in how many genres and sub-genres? It’s hard to believe, but 9 books with one on the way. 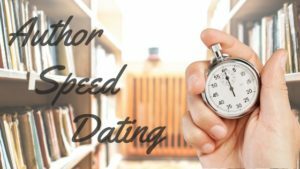 They are all contemporary romances, but range with sub-genres of romantic suspense, new adult, and multicultural romance. 7. Love It or List It or Modern Family? I’d have to go with Modern Family as it’s one of my family’s favorite shows. 8. What is your favorite way to celebrate after you receive a new book contract or get a great review? Going out to dinner with my family and announcing it at our monthly Greater Detroit Romance Writers of America meeting. 9. What is your best advice for new writers? Be encouraged by all praise and heed the criticism to help you become a better writer. But…do not let either define you. 10. Extra-large French fries or a perfect square of dark chocolate? Chocolate every time, all of the time. Now, if we could make deep fried chocolate French fries, that would be something. 11. Which of your books gave you the most trouble, and what helped you make it to “the end”? I struggled with the conflict and black moment in Where the Lotus Flowers Grow. It was almost too dark, especially for me. But in the end, I kept it because the whole theme of the book is that love can bloom in any dark corner. Just like the Lotus Flower. 12. Do you have a music playlist for writing? If so, list some of your go-to artists. Absolutely. In fact, every book has a playlist and artists that helped me get through it. I love Indie artists like Hugo to classics like James Taylor. My playlist is super eclectic and frenzied just like my characters. 13.Virginia Woolf or Maya Angelou? I’ve read both and enjoyed them, but I’d have to go with Maya Angelou. I read I Know Why the Caged Bird Sings in high school and it really resonated with me. After all, the beautiful heroine used literature to make her stronger in the face of severe trauma. 14. What do you do when you’re in the middle of a book and a new idea pops into your head? I turn my head and mutter, “squirrel.” It depends if I’m under contract, but I might start writing the new book if the idea makes my fingers twitch enough. 15. Were there other authors who helped you along the way on your writer’s journey, and how did they make a difference for you? There are too many to name. I was inspired by amazing authors I had read, but also by those who I had met through my local writing group from our knowledgeable speakers to our members. These brave and lovely authors helped pave my writing journey. Steam from the bathroom swathed him as he stepped out, a towel looped low around his hips. His naked chest, revealed muscles chiseled to perfection. I’d seen him when he arrived, but I wasn’t paying attention. And now my attention would not go anywhere else. His damp hair, the color a mix of sun with flecks of sand, lay unruly against his head. His expression conveyed annoyance. I pivoted, my bum backing into the bureau. He narrowed his eyes. Green eyes? Brown? They were both. My fingers clutched the book, digging into the hardback cover, holding it against my chest as if it could shield me from his voice, deep and husky. I shrank back farther, praying the floor would quake open and swallow me up. His eyes shifted to my hands. He blinked, staring at the book. As much as my eyes were absorbing, my mouth refused to work. What could I possibly say to him? There were no excuses. I’d trespassed and, as a result, I’d be sacked. He picked up a few articles of clothing from the open suitcase on the bed, then looked back at me. “Stay.” He closed the bathroom door behind him, disappearing into the diminishing poufs of steam. I should run. But my feet were stuck to the floor, even though my legs were shaking. For once, I was grateful the sari would hide that. When he came out a few minutes later, he wore soft, faded jeans and a green rugby shirt. He stood a few feet away, but I could smell fresh soap and sweet mint radiating from his body. Lotus girl? Was he talking to me? “Let’s try this again. Mera Nam, Liam Montgomery,” he said in poorly pronounced Hindi. As if rest were a possibility. “Ah, here we are.” He repeated the introduction in Punjabi, Gujarthi, Marthati, Tamil, Bangali, and even Sanskrit. Each time, he looked at me with a hopeful expression. With my continued silence, he grew more disappointed. Somehow, his desperation to talk with me made the tension dissipate just as the steam had. Finally, he threw his phone on the bed. He shook his head in resignation, offering me a self-deprecating smile. “That’s all I got. I suppose we shall never speak.” He stared at the book again. I held it out to him with both hands. He stepped closer, his bare feet oddly beautiful. Later, I would wonder why I didn’t just lay the book back on the bureau. His hands, large with long fingers, gripped the other edge and stilled the wobbling tome. I tilted my chin, forcing myself to look at his face. I knew I’d regret the moment if I chose to…squint. He tugged on it. I wouldn’t let go. “It’s not an autobiography. Dickens said his most autobiographical book was David Copperfield. Not Nicholas Nickleby.” I thought I’d said it in my head, but the way his jaw dropped made it clear I’d articulated the statement. Liam smiled again, his expression a mixture of curiosity and suspicion. 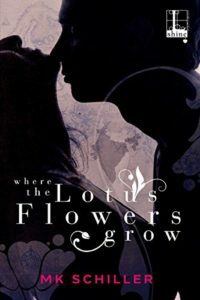 Where the Lotus Flowers Grow, a September 2016 release from Lyrical Shine, an imprint from Kensington Publishing, may be purchased from these retailers: Amazon, Barnes & Noble and Books-A-Million. MK Schiller was born a hopeless romantic in a hopelessly pragmatic world. 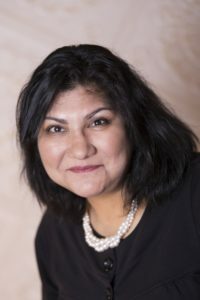 She has a full-time life and two busy teenagers, but in the dark of night, she sits by the warm glow of her computer monitor and attempts to conjure up passionate heartwarming stories with plenty of humor. She hopes you enjoy her stories and always find The Happily Ever After in every endeavor. Stay in touch with MK through her website, www.mkschillerauthor.com, her Facebook author page and Facebook profile, her Amazon Author Page, Twitter and Goodreads.